We were made aware of a problem with our most recent curated rapid reporting packet, number 30. It turns out that there were 11 cases in that packet that were also in packet 29. This occurred because of a bug in the code we use to generate our balanced packets. Essentially, the code was incorrectly identifying which cases were not in use (and therefore chose cases already in packet 29). I’ve fixed this bug, removed the old packet 30 and regenerated a new packet 30 with new unique cases. Most of you won’t notice any difference but those of you who have sat packet 30 will have had your score for that packet reset. Thanks to Zeid for pointing this out. We’re pleased to announce the immediate availability of 5 new rapid reporting packets. That’s an additional 150 cases to practice. These packets are available to all subscribers, current and new, at no extra charge. By far the most requested feature for the site has been for us to add the ability for you to manipulate the images in your browser to help you better see any abnormality. I’m pleased to announce that with immediate effect we’ve added this to our rapid reporting module. The buttons are fairly self-explanatory. The plus and minus buttons will zoom in and zoom out respectively. The dark and light sun icons will adjust the contrast of the image and the looped arrow will reset the image to its original state. It’s also possible to zoom in and out of the image on desktop browsers simply by scrolling the mouse wheel (or two-finger scroll over the image on a Mac). Zooming can be achieved on iOS devices with pinch gestures. Why are the buttons different on different platforms? The zoom buttons are omitted on iOS because the pinch gesture works so well for zooming. Since the images are served to your browser at full resolution, you don’t lose any detail by using mobile Safari’s built-in zoom feature. The main issue at the moment is with Internet Explorer. I’ve made it clear before that I loathe IE. The bottom line is that (at least for the moment – certainly until Microsoft implement CSS filters properly) you can’t adjust the contrast of an image using Internet Explorer. If you’re using a PC, I recommend FireFox over Chrome. If you’re using a Mac then this won’t be an issue. A few people have asked recently how we go about selecting the cases for our rapid reporting module and how we create our exam packets. Rather than answer the same question 20 times, I thought I’d take the time to write an article about the process. How do we choose the cases? All cases are hand selected by one of our three founders. Generally they are stumbled upon during our day-to-day job of reporting plain films although we are occasionally offered examples of classic cases by our colleagues. The majority of the cases have been collected over a number of years. It may be hard to believe but one of the most difficult aspects of building the rapid reporting module is finding good normal cases. We’ve had very few “complaints” overall about our images but when we do, it’s often because a tiny subtle abnormality has sneaked in under the guise of a normal film. Things like cervical ribs, excessive degenerative change, etc are common culprits. It’s for this reason that we now actively exclude normal variants from our cases. Once we have the cases, what happens next? Every case that is added to our database goes into a special area of our database called “quarantine”. Whilst in this area, the question is not shown to users of the site until removed. Every question is double read by a post-FRCR radiologist and many of the cases have been triple read for accuracy. If there is any doubt about the quality of the image or the diagnosis then the question is removed and you (the end user) never see the question. How do you make your packets? We are very proud of how we do this. Rather than simply randomise 50% normal cases and 50% abnormal cases, we use a custom algorithm that I wrote. First, the algorithm randomises how many normal and abnormal cases will be in each packet of 30 questions. Generally harder packets have more normal cases (although this is not always true). As each case is given an arbitrary difficulty rating (1 = easy, 5 = very difficult) the algorithm will then determine the ratios of discriminator images (i.e. very hard) to easy cases to include in the packet. The algorithm will also try to balance the packet in terms of body region. Finally, the order of the cases is jumbled up and released to the wild for your enjoyment. Hopefully this gives some insight into how much effort goes into making our packets fair and balanced. We at Revise Radiology firmly believe that our packets are as balanced as possible. It’s for all of the complicated processes described above that we call them curated. So many exciting things are happening here at Revise Radiology. We have five packets in quarantine at present and are currently triple-checking them for accuracy. Once done, they will become available to all users free of charge. Watch this space! It’s been 5 months since we launched Revise Radiology to the world. Since going live we have served over 110,000 questions to our users and, I’m pleased to say, without any significant downtime (hurrah!). We’ve had a lot of positive feedback from people and have learned a lot not only about running a high traffic website but also about the intricacies of running a limited company. All this is well and good but we’re not resting on our laurels either. We are currently constructing more rapids packets to add to our rapid reporting database. We will add 5 by the end of the month and we hope to add a total of 10 by the next sitting of the rapid reporting module in April. These will of course be accessible by current subscribers at no extra charge. We’ve individually looked at literally 1000s of permutations of answers to our questions as well as feedback on specific questions from our users and have made adjustments and updates to our database. We value your feedback and want you to know that every time you flag or dispute a question that one of the founders will look at your response – after all, if you take the time to help us improve our product then it’s the least we can do. Work is coming along on other minor improvements to the site. I am working on integrating better viewing tools for the rapids images (such as improved zooming, windowing, etc). I don’t have an exact time frame for its introduction but work is ongoing. Whilst looking at some of the data in our (frankly huge) database, I also discovered that we have users from 25 countries. That just goes to show how well regarded the UK FRCR exam is not to mention how far word can travel about a site! I think 2015 is going to be a great year moving forwards. Keep your eyes peeled for more content and new tools in the near future. You may have noticed when you signed in this morning that your stats look different than they did yesterday. That’s because we’ve been busy beavering away behind the scenes improving not only how our statistics are calculated but also how they’re presented to you. A couple of users helpfully told us that they thought their stats didn’t seem correct. Specifically, they believed that they were scoring higher than our software was telling them. After investigating the matter, we realised that we had been including any attempts you had made during a trial in our data. We were also including data from rapids packets that had not been completed. In hindsight, that’s not very helpful as it’s unlikely that most users are trying very hard when undertaking a trial. We now specifically exclude all attempts at questions you may have made during a trial as well as any packet that you’ve not completed (for instance, if you got pulled away from your computer mid-exam). On your home page is a short summary informing you of the time to the next exam sitting as well as some simple statistics. We’ve now improved the accuracy of these figures (for the reasons outlined above) as well as now including the site average for that module so you can quickly compare your performance with the rest of the site. When choosing which curated rapid reporting packet to sit, there’s always been a simple table listing all available packets. This not only tells you your most recent and highest score for each packet but also the average of the metaverse (all users). Since we now exclude data from any unfinished packet, this has resulted in a significant increase in the average score of a packet. This is because lots of people would start a trial, attempt 5 or 6 questions in a packet and then move on, thus lowering the average. The figures now give a much more realistic idea of how your peers are performing. 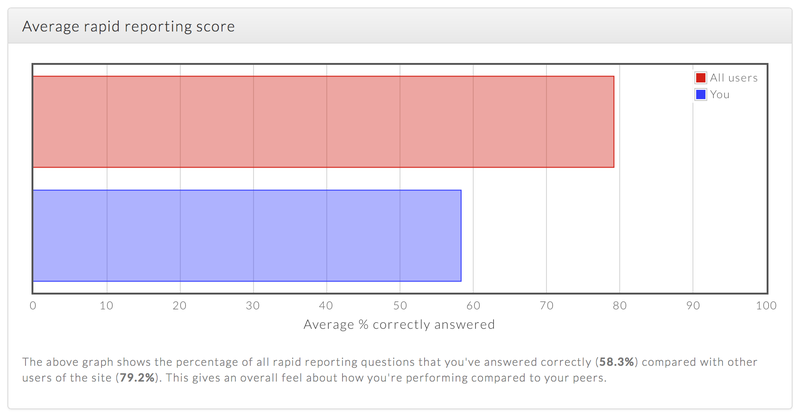 As you can see, this simply shows the percentage of questions that you get correct (both in practice sessions and mock exams) compared to everybody else on the site. There’s a little known feature on the site that’s worth briefly covering here. You can reset your statistics at any time by visiting the statistics panel on your settings page (reachable from the drop down menu by clicking your name in the top right of the screen). This allows you to reset your stats in any module that you’re currently subscribed to. Not only can you reset all data, you can also reset data between particular dates. So if you want to reset all of last week’s statistics, you can. We’re thrilled to announce that we’re launching our rapid reporting module for immediate purchase today. The rapid reporting component of the FRCR can be terrifying. The candidate is given 30 plain film cases (a packet) and has to decide if each case is normal or abnormal and has 35 minutes to do so. The exam is notorious for including very subtle abnormalities as well as normal variants to try to catch the candidate out. With our rapid reporting module, you can practice your timing and expose yourself to almost 800 cases in preparation. 25 curated packets. These are carefully crafted to mimic the actual FRCR exam as closely as possible. 800 individual cases to practice on. A balanced mixture of abnormal and normal images. Detailed statistical analysis of your performance – both overall and on a per-case basis. You can easily compare how you are performing against other users of our site. Customisable practice sessions and packets. Fancy sitting down and testing yourself on a bunch of chest X-rays? With our rapid reporting module, you can do just that. We’ve worked really hard over the last few months to bring this module to you and we really hope you enjoy using it. After months of hard work, we’re really pleased to announce the launch of reviseradiology.com to the world. The anatomy revision module is complete with 1600 questions (that’s at least 16 full practice exams) and we can’t wait to see what you think of it. The rapid reporting module is currently under construction and we hope to launch that within the next 6 weeks.